Due to an already accelerated growth rate, large breed puppies (those with an expected adult weight of 25kg or more) can be at risk of over-nutrition from elevated nutrient levels commonly found in puppy formulas. Nutra-Nuggets Large Breed Puppy Formula contains the ideal amount of calcium and fat needed to help promote proper bone development, while providing the optimum levels of nutrients all puppies need to grow up healthy and strong. Chicken meal, brewers dried rice, barley, oat flakes, maize, chicken fat, maize gluten meal, dried plain beet pulp, chicken digest, fish meal, linseed, salmon oil, potassium chloride, salt, glucosamine hydrochloride (0.075%), and chondroitin sulphate (0.025%). 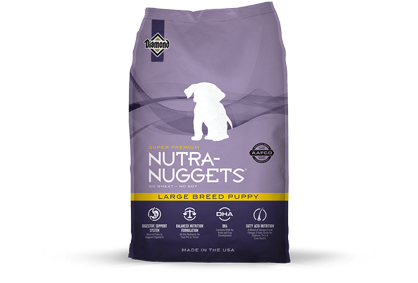 Nutra-Nuggets Large Breed Puppy Formula is formulated to meet the nutritional levels established by the AAFCO Dog Food Nutrient Profiles for All Life Stages.